Anubha Bajaj, Histopathology, AB Diagnostics, Panjab University, Chandigarh, India. Post-transplant lympho- proliferative disorders (PTLDs) are described as a composite accumulation and propagation of lymphoid and plasma cells with a probable malignant transformation, appearing in an immune-deficient individual subsequent to a solid organ or an allogeneic transplant. Pseudo lymphoma has been detected in the renal allograft recipients . Malignant Lymphomas have been described in the transplant recipients . Immune-suppression following the administration of cyclosporin A and immune antibodies to Epstein-Barr Virus (EBV) may be accompanied by lymphomas Administration of cyclosporine and steroids may initiate the regression of the lymphoma and PTLDs . Contemporary immune-suppressant therapies have expedited a progressive organ transplant protocol in the last few decades. The transplants have multiplied and so have the designated tumours in the transplant recipients, with an estimate of 3 to 5 times. Congenital, acquired or a pharmacologically induced immunedeficiency may augment the lympho-proliferative process [2,3]. Various monoclonal or polyclonal proliferations such as the plasma cell hyperplasia or a non-hodgkin lymphoma, are delineated in the immune- suppressed transplant recipients. 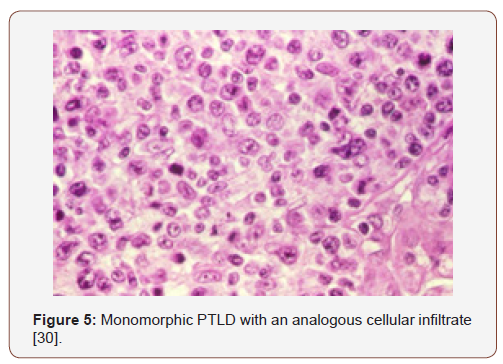 Clinical and morphological diversity characterizes the condition which is designated as the “Post Transplant Lympho-Proliferative Disorders” (PTLDs) which may occasionally evolve to overt lymphoma . Paediatric transplant recipients commonly exhibit lymphomas (50%), in contrast to the cutaneous tumours (20%). However, the adult patients usually progress to the tumefaction stage . An Epstein Barr Viral contamination may initiate the PTLDs, either as a primary infection or as a reactivation of the virus. A polyclonal multiplication of the B cells may develops. The immunesuppressive regimen usually obliterates the T cell immunevigilance, initiates mutations with the assembly of onco-genes and tumour suppressor genes, elucidating malignant cellular clones which represent the episomal EBV DNA. 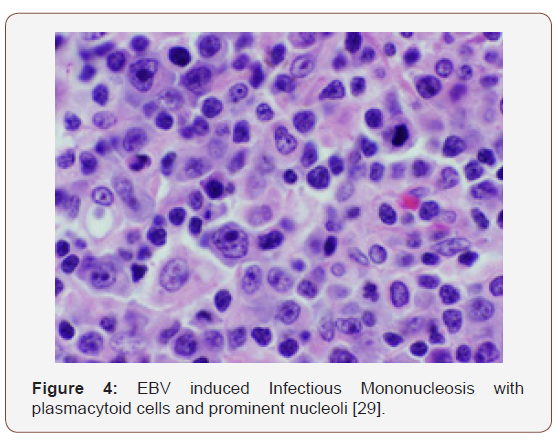 Clinical manifestations of a non-specific viral syndrome or infectious mononucleosis may emerge, besides an asymptomatic primary EBV infection. Anti EBV immunoglobulin G antibodies may be determined in the individual, as the virus lodges in the naso-pharynx. Numerous proteins and molecules of the EBV genome (DNA) may be encrypted. The Epstein Barr Virus (EBV) is a gamma herpes-virus (HHV4) constituted of a genomic integrity of 172 kbp with a 100genes . The serology depicts a universal sero- positivity of > 9% in adults. The contamination ranges from a sub-clinical infection to a full-blown infectious mononucleosis syndrome (depending on the duration and age of exposure to the primary virus). The viral transference may occur through the saliva (kissing disease). The cellular infiltrate is a preponderant B cell phenotype though T cells and concordant epithelial cells may be recruited [3,5] [Figure 1]. 1. Latency type 1 classically depicts EBNA 1 along with EBV contamination, even in instances which lack tumefaction. However, burkitt’s lymphoma may be singularly delineated by the EBER 1 & 2. 2. Latency type II enunciates EBNA 1, the EBERs and the LMP 1, 2A and 2B which characterizes a nasopharyngeal carcinoma, hodgkin’s lymphoma and nasal non-hodgkin’s lymphomas. 3. Latency type III may be demonstrated in the lymphoid manifestations of immune compromised individuals and configures the entire spectrum of the viral proteins. Epstein-barr virus can be detected by In Situ Hybridization (ISH) which may be employed for the histological identification of EBERs. Immune-histochemistry may also be applicable for anti LMP 1 & 2 and anti EBNA 1 antibodies. A Southern blot may expose a particular clone of the virus (EBV) and may be employed . A Real Time PCR may be adopted in order to ascertain the concordance betwixt the viral burden and the evolution of a PTLD, though the interconnection may not be accurate with extreme immune compromise [6,7]. 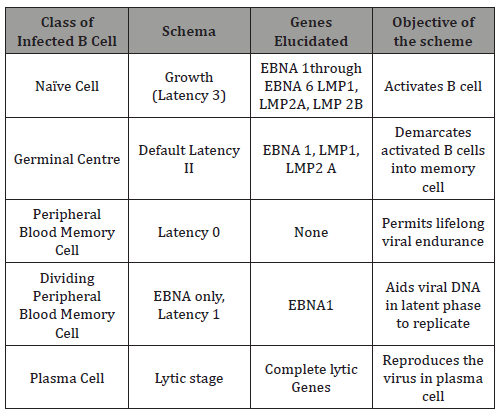 Table 1: Transcription Patterns of EBV requisite for instituting and cultivating infection [3,4]. The initial viral contamination may elucidate intense immune reaction. The mononuclear cells of infectious mononucleosis (atypical lymphocytes) are the chief cytotoxic T cells engaged in the antigenic phase of viral activation. The memory B cells may recognize the antigens during the latent viral activation, thus ensuring an immune perseverance. The viral lysis involves a potent viral replication with a decimated host cell eradication. Subsequently, the latent virus initiates a ligand free B cell activation and maturation. This aids the persistence in the memory B lymphocytes. A viral repository is thus generated, which is competent for viral re-activation and transmission. 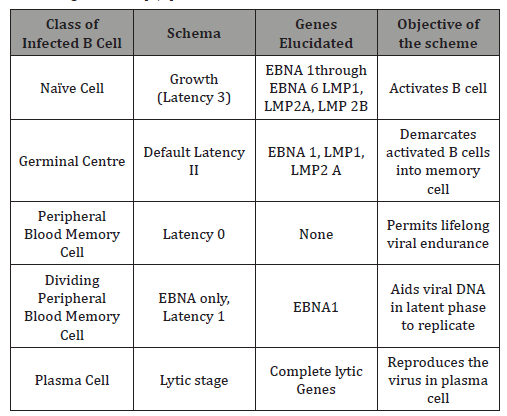 Ten genes may be variably configured for the latent viral proteins  [Table 1]. EBNA 1: Cultivates the DNA and aids the viral replication (lacks elucidation on MHC I). EBNA 2: Monitors the gene expression of the virus (such as LMP 1 and LMP 2). LMP: Augments BCL2, A20, c FLIP, (anti-apoptotic molecules), initiates NF -kB, MAPK, P13K/AKT pathways (pro- proliferation). LMP2: generates antigen independent BCR signalling and modification. EBER 1 & 2: The non-poly-adenylated RNAs instigate the secretion of interleukin 10 (which decreases the cytotoxic T cells). The latently infected cells display an abundance of nuclear RNAs as demonstrated by immune staining. The EBV is a transformative virus which is a principal determinant in a myriad of human neoplasm such as . B cell: Burkitt;s Lymphoma, Hodgkin’s Lymphoma, Diffuse Large B Cell Lymphoma, Primary effusion Lymphoma, Primary CNS Lymphoma, PTLDs. T/NK cells: Extra-nodal NK/T cells, aggressive NK leukaemia, Angioimmunoblastic T cell Lymphoma. Carcinoma: Nasopharyngeal carcinoma, gastric adenocarcinoma. The tumours may originate in immune competent or immune deficient hosts. The latency of the virus is disease specific . 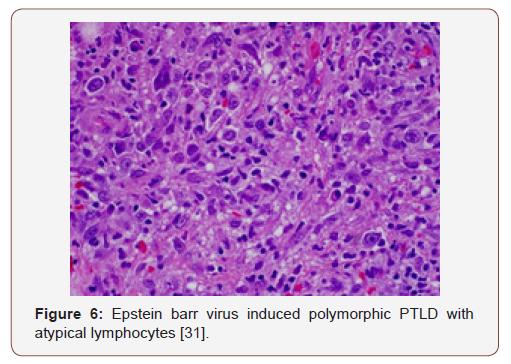 PTLDs may be used as a prototype for the lymphomas induced by Epstein barr virus, while demonstrating the impact of the initiator and co-factor. Majority (60-80%) of the PTLDs may be reactive to the virus (EBV) and the preliminary cases may depict an absolute (100%) sero-conversion . 1. Latency type III may be elucidated with the transformation protocol. The disease originates in the germinal centre B cells (especially with L 1 & 2 genes in healthy carriers). Immune suppression emerges especially with enhanced cytotoxic CD8 T cells with uncontrolled emergence of the L3 gene accompanied by the pro-growth/anti-death arrangements. 2. Preliminary lesions display a lymphoid hyperplasia with cellular augmentation and somatic hyper-mutation in the germinal centre along with adjunctive transformation and evolution of an oligoclonal component (cited with polymorphic PTLDs). 3. Monclonal malignancy/Monomorphc PTLDs The disease protocol necessitates an appropriate investigation and precautionary therapies. An understanding of therapeutic opportunities based on the interpretation of the viral pathogens may be available. 2. Lymphomas with immune deficiency (Human immune deficiency virus- HIV reactive and post-transplant). The immune inadequacy in the transplant recipients, subsequent to the provision of immune-suppressants in order to avert transplant rejection, engenders the emergence of the PTLDs . The proliferation is consistent with the kind of organ transplanted, the age of the recipient and the immune-suppressive regimen preferred. PTLDs ensue with an estimated 1% in renal transplant recipients, up to 5% with hepatic transplantation and roughly 20% in cardiac or intestinal transplant receivers . With the un-manipulated bone marrow, the probability of PTLDs in bone marrow transplant patients is < 1%, or in the manipulated bonemarrow by way of the T lymphocyte depletion, the possible evolution of PTLDs may extend up to 7.5% . Therapeutic intervention for Graft Versus Host Disease (GVHD), particularly when associated with the anti T cell medication, accelerated donor age, the incorporation of Total Body Irradiation (TBI) and the employment of non-HLA identical individuals, may induce the emergence of PTLDs . The transplant recipients of non-HLA identical organs, in combination with grafts deficient in T cells, elucidate possible PTLDs in an estimated 15% instances, a probability which may diminish if the umbilical cord blood is utilized. PTLDs may appear in recipients of a Bone Marrow Transplant (BMT) with co-existent diseases such as a congenital immune deficiency, which may elevate the appearance of PTLDs, in contrast to the patients treated with a bone marrow transplant for adjunctive maladies . Hepatic transplant recipients with concordant auto-immune disorders such as autoimmune hepatitis or primary biliary cirrhosis may also enhance the occurrence of PTLDs . The therapeutic regimen employed for immune suppression also determines the frequency of PTLDs. Allocated suppressants along with the supervised drug levels of anti-lymphocyte globulin, steroids and azathioprine with or without cyclosporine may categorically reduce possible PTLDs. The possibility of PTLDs may be elevated with the employment of Tacrolimus, though the premise is debatable . 1. Transplanted immune-deficient individuals with incidents of transplant rejection, necessitating an increase in the immune suppression, particularly with the therapeutic application of anti T cellular antibodies. 2. Transplants associated with a negative Epstein barr virus serology. 3. Pulmonary or small intestinal transplant. 4. Transplantation in young children (<5 years) [9,10]. With a reduced T cell immunity against the virus (EBV), the prevalence of PTLDs is maximum in the first year following transplantation. Paediatric patients elucidate an increased percentage of PTLDs, in contrast to the adult recipients with identical grafts . The PTLDs maximally delineate a B cell phenotype (86%), though a T cell lineage (14%) and a minimal percentage of null cell phenotype (1%) may also emerge. PTLDs may be typecast depending upon the phenotypic, histological and molecular characteristics besides the clinical advancement of disease. The contemporary WHO classification is employed for analysing the lesions . 1. Preliminary or early type of PTLD (described in 10% patients) which demonstrate a harmless lymphoid and a plasma cell proliferation. 2. 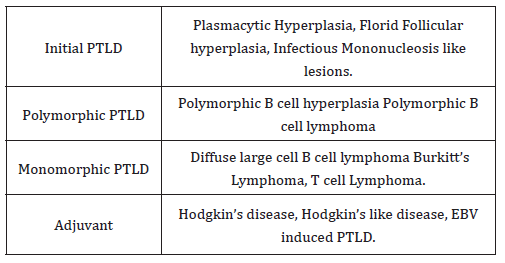 Polymorphic PTLDs (discovered in 5-10% instances) are comprised of a detrimental lymphoid and plasma cell propagation. The cellular component may be monoclonal or polyclonal. Classically, a population of miniature blasts of the B cell phenotype are interspersed with mature lymphocytes, histiocytes and plasma cells. The diagnostic criterion of monomorphic PTLDs are not fulfilled. 3. 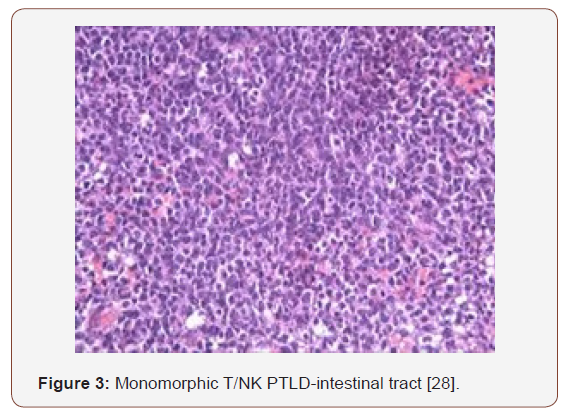 Monomorphic PTLDs (constituting 70-80% cases) are concocted of a deleterious, monoclonal lymphoid permeation. The diagnostic paradigm of a B or T cell Lymphoma, as per WHO standards are realized. Diffuse large B cell lymphoma is a frequent manifestation. 4. Classic Hodgkin’s Lymphoma c HL (expressed in <5% individuals) . Preliminary lesions of PTLDs incorporate a reactive progression in the initial three months of therapeutic induction. The cellular formations articulated may be a florid follicular hyperplasia, plasma cell hyperplasia, polyclonal lymphomas and infectious mononucleosis like disease [12,13]. Young individuals may lack the infectious viral (EBV) trigger and may preferentially depict a tumour occurrence in the adenoids, tonsils, spleen and infrequently, the lymph nodes. An architectural conservation of the specific organ, a polymorphous and frequently polyclonal lymphoid infiltrate with dispersed B and T cellular phenotypes, molecular redistribution of the immune-globulins and viral (EBV) molecules, as analysed by the polymerase chain reaction or a southern blot, assists in categorising the lesions on histology . Mutations of c-myc, ras and p-53 are generally absent. The classic PTLDs consistently ameliorate by decreasing the dose of the immunesuppressants (Figure 2-11). 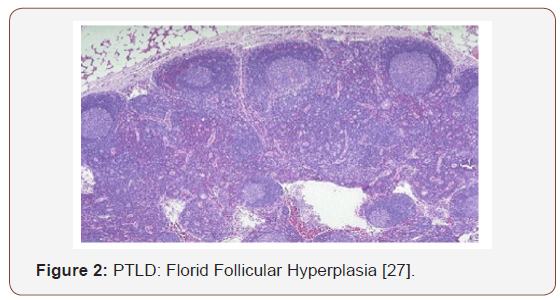 (Post-Transplant Lympho-Proliferative Disorders) constitute of indeterminate phrases such as the polymorphic B cell hyperplasia or a polymorphic B cell lymphoma . The disorder usually evolves in a duration of 4 months to 8 years following a transplant. The lesions may incorporate an extra-nodal site and the histological configuration of the involved organ may be obscured. A multitudinous cellular spectrum formulates the lesion with the typical occurrence of plasmacytoid lymphocytes, plasma cells and immunoblasts. Phenotypic B lymphocytes are predominant, though a smattering of T lymphocytes may be visualized. Distinction of light and heavy chain immunoglobulins by immune –histochemistry may be challenging in certain instances. However, a monoclonal cell infiltrate, immunoglobulin heavy chains or viral (EBV) particles may be delineated with molecular methodologies. Mutations of genes such as c-myc, ras and p-53 may be infrequent [3,4]. Customarily, the neoplasm retrogresses with the reduction of immune-suppression. A few lesions may advance and necessitate an intervention in the form of monoclonal antibodies. These are commonly extra-nodal and encompass B cell lymphomas, conformably Burkitt’s lymphoma. The lesions are morphologically identical to the ones appearing in the immune competent individuals. Characteristically, the tissue deteriorates, and copious foci of necrosis may be demonstrated. The cytological manifestation may not be monomorphic, even as the multi-lobular cellular infiltrate may be predominantly comprised of blasts or the emergence may resemble centroblasts or immunoblasts [3,4]. Monomorphic PTLDs delineate a mature B cell phenotype. Light and heavy chain surface immunoglobulins may be evidenced by the immune peroxidase reaction. Adjunctive molecular techniques categorize most of the lesions as monoclonal for immunoglobulin H and for viral (EBV) particles. Mutations of the oncogenes ras and p53 are consistently detected [3,4]. Curtailing the immune-suppression may not alleviate the lesions and a chemotherapeutic regimen may be required. An estimated 10% of the non-hodgkin’s lymphomas discovered in the transplant recipients are T cell lymphomas. The patients frequently exhibit a minimal response to therapy thus, the prognosis is unsatisfactory. 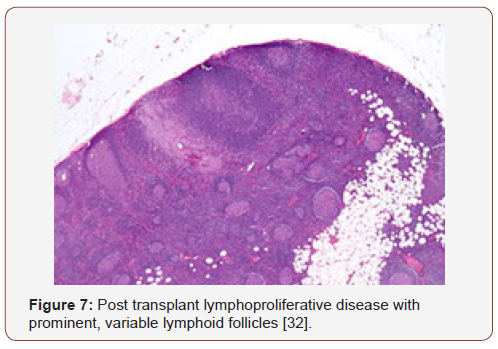 Classic Hodgkin’s lymphoma appears exceptionally in the transplant recipients. PTLDs may also arise in the absence of viral (EBV) infections. An estimated 8%-14% lymphomas unrelated to the Epstein barr virus may appear in the transplanted patients, with specific clinical aspects. PTLDs may be delayed and eventually may appear in the transplantation stage to involve the lymph nodes. A reduction in the immune suppression may not modify the disease progression [13,14]. Fatigue, malaise, weight loss, non-specific systemic symptoms, acute infectious mononucleosis like syndrome, graft malfunction, Leukocyte Adhesion Molecule (LAD) deficiency and overt PTLDs may constitute the clinical spectrum of the disorder . Table 2 Estimate of PTLDs corresponding to the category of transplant . 1. Transplantation of a lymphoid aggregate (SOT). 2. Exhaustion of allograft T cells (HSCT). 3. Immune suppression supervised by T cells (in conjunction with monoclonal antibody OKT -3, anti thymocyte globulin and calcineurin inhibitors). 4. Magnitude and duration of immune-suppressive therapy (graft versus host disease). 5. Concordance of Epstein barr virus non-reactive recipient with an Epstein barr virus reactive donor (paediatric patients). Extra-nodal manifestations are frequent (80%) with majority of the patients elucidating a progressive disease (70%). The gastrointestinal tract is implicated in 30-40% instances and the central nervous system in 20-25%. A staging system for the disorder (PTLDs), particularly for the polymorphic variant, is a challenge to establish. The stage of the lympho-proliferation (PTLD) should be able to reproduce the magnitude of the disorder, local versus disseminated disease and a nodal versus extra-nodal, organ effectuation. Estimated half (50%) the instances demonstrate a preliminary, multitudinous organ or a nodal, lymphatic emergence . The lymph nodes and the gastro intestinal tract are frequently incriminated. The standardized Ann Arbor classification has been proposed, though no explicit system has been adopted. 2. Singular or multitudinous extra nodal tumours. 3. A rampant, disseminated lymphoid proliferation with the occurrence of sepsis. The paediatric population frequently elucidates the mononucleosis syndrome following organ transplantation, specifically with primary viral (EBV) contamination. Otolaryngological symptoms may be anticipated in the disease (PTLDs) of the young . Phenomenon-which imitate tonsillar hypertrophy, pharyngitis, necrotizing pharyngitis, lymph node enlargement, sinusitis and otitis media may be described . Severe types of disease (PTLDs) may manifest as a localized, organ obstruction. Disorders (PTLDs) which appear following an organ transplant enunciate a distinct morphology with a steady clinical evolution. Extra-nodal and visceral conditions are frequently accompanied by painless lymph node enlargement, gastro-intestinal, pulmonary, or rare central nervous system manifestations [3,4]. A solitary, prominent tumefaction may be detected in majority of the lymphatic proliferations (PTLDs). The malignancy may also encompass the grafted tissue, the frequency of which depends upon the specific location of the graft. Pulmonary or Intestinal transplantation may be frequently followed by instances of graft insinuated proliferations (PTLDs) . Roughly one-third of the Hepatic or Renal transplants delineate the disorder (PTLDs) in the graft. Lymphoid proliferations (PTLDs) following Cardiac transplants may be uncommon. The location of the tumefaction decides the clinical manifestations of the affliction (PTLDs). Gastro-intestinal tumours may present with abdominal pain, haemorrhage, abdominal perforation and indications of acute abdomen. Central nervous system tumours may express features related to the magnitude of the tumour or localized necrosis (space-occupying lesion) . Lymphoid proliferation (PTLDs) may arise at insignificant locations such as the pleura or as a solitary dermal- epidermal representation . A fulminating syndrome is exceptional (1%) and requires a quick evaluation in order to prevent significant mortality. Post-transplant lymphoid proliferations (PTLDs) are on the rise and the condition frequently appears within two years of transplantation, though maximum instances are detected in the initial year following a transplant. The severity of the lesions is proportional to the magnitude of immune-suppression. The proportion of emerging lymphoid proliferation (PTLDs) subsequent to haematopoietic stem cell transplant is 60%-80% and an estimated 50%-60% appear after the solid organ transplant. Nearly all (90-100%) of the preliminary lesions illustrate an affinity for the Epstein barr virus while the progressive cases exemplify a 50-80% probability of viral ingression . Aggressive post-transplant immune suppression enhances the possibility of lymphoid proliferation. Conventionally, the proliferations (PTLDs) are of the recipient category in solid organ transplant and may involve the allograft, in contrast to the haematopoietic stem cell transplant which implicates the donor paraphernalia [3,4]. The probability of emergence, the distinct categories of the proliferation (PTLDs) and the miscellaneous symptoms accompanied with the syndrome guide the evaluation of the disorder . The site of organ malfunction may be a pointer for pertinent diagnosis such as a precipitous, solitary or systemic lymph node enlargement. Thus, the lymphoid proliferations (PTLDs) must be demarcated from the adjunctive diagnoses of nodal pathologies [19,20]. Abdominal pain accompanied with intestinal haemorrhage or a nodular ulcer depicted on endoscopy, may imply a malignant lymphoid proliferation (PTLDs) of the gastrointestinal tract. Perpetual headache or a central nervous system ingress may delineate the lymphoid proliferations (PTLDs) in the brain . Upper respiratory tract infections and lymph node enlargement, unresponsive to the antibiotic therapy, may infer a conclusion of post-transplant proliferation (PTLDs) of the respiratory tract . Multitudinous nodular densities may be enunciated on a plain x-ray chest with the emergence of a pulmonary pathology . Lymphoid proliferations (PTLDs) may appear in the transplanted graft. Epstein Barr viral serology may be employed to assess a current or an isolated infection . Nevertheless, the presence of a progressive or quiescent viral (EBV) infection, may not indicate the appearance of a malignant clone of lymphoid cells (PTLDs) . The presence of an Epstein Barr virus may be evaluated by the quantification of immunoglobulin M against the Viral Capsid Antigen (VCA-IgM) which is beneficial in analysing the progression of the viral (EBV) infection, although the immune deficient individuals may mount an unpredictable immune response. The amount of the copied viral (EBV) genome, as interpreted by a quantitative polymerase chain reaction in the peripheral blood, is an advantageous procedure to define the class of viral (EBV) infection and the possible accompaniment of lymphoid proliferations (PTLDs) [14,17]. Evolution of lymphoid proliferations (PTLDs) is concordant to the increased distribution of the viral genome. Infected (EBV- positive) individuals usually demonstrate fewer than 2000 copies of the viral genome per microgram of red blood cell (RBC- DNA). The quantifiable viral genome may amplify by 10-100 times in established lymphoid proliferation (PTLDs). The disorder (PTLDs) may recede with the decline in the disseminated copies of the viral genome. 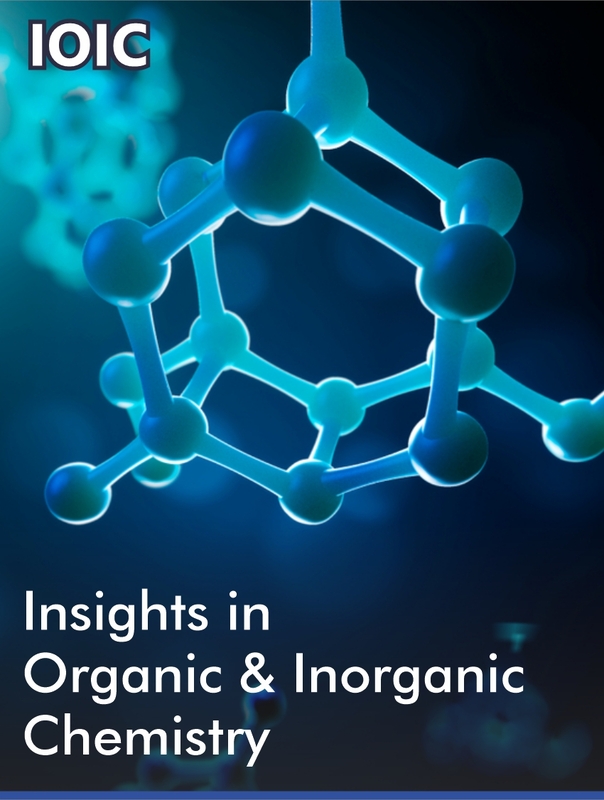 The methodology may thus be beneficial for supervising the applicable therapeutic modalities . Specimens of histopathology obtained from the graft or the transplanted organ require a meticulous inspection in order to eliminate the emergence of a lymphoid proliferation (PTLDs), as an augmentation of the immune-suppression for an impending graft rejection is contraindicated in the imminent proliferations (PTLDs). A histological evaluation may be confirmatory. Samples of histology may be examined for a B cell predominant permeation and a concomitant in situ hybridization (ISH) analyses may be conducted in order to discern the existence of a viral (EBV) aetiology . Preliminary treatment is by diminishing the immunesuppression and a primary surgical excision, contingent to the site and dissemination of the disease. Subsequently, interferon alpha (currently an exception) or monoclonal antibodies and chemotherapy (for specific cases) may be employed . 1. Immune suppression: The decline in the medication is adequate in roughly one-third instances. The efficacy of the treatment depends upon the category of lymphoid proliferation (PTLDs) and the kind of transplant adopted [3,4]. An ensuing graft rejection may mandate an augmentation of the immune suppression and inculcate secondary organ damage. 2. Systemic antiviral therapy: Acyclovir may be utilized as it is an inhibitor of the viral (EBV DNA) reproduction (though efficacious prior to the emergence of a proliferative phase), ganciclovir and cidofovir present with identical outcomes. 3. Cytokine Therapy: may be incorporated to activate the host immune response in order to eradicate or restrict the lymphoid proliferation (PTLDs). Interferon alpha is an employable frequent adjunct and is beneficial when a decimated immune suppression is unable to regulate the disease. However, a graft rejection may ensue. Rituximab has all but replaced the option. 4. Radiotherapy and Chemotherapy: The quantity of adoptable radiotherapy is yet to be defined. 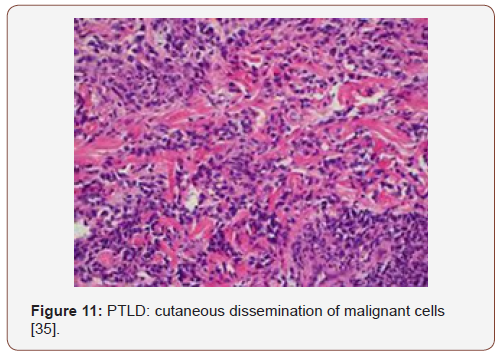 Central nervous tumours and site-restricted lymphoid proliferation (PTLDs) may benefit from the option as does a primary cerebral lymphoma and the compression of an integral anatomical structure by the tumour . Chemotherapy: Employment of chemotherapy is debatable. Cyclophosphamide alone or in combination with rituximab or as a component of CHOP (cyclophosphamide, adriamycin, vincristine, prednisone) may be adopted. Comprehensive remission may be obtained in approximately 70% individuals. Drug induced toxicity, graft malfunction, iatrogenic infections with resistant microorganisms and mortality on account of the pharmacological immune-suppression may emerge [4,5]. Chemotherapy is usually cytotoxic for the propagating B cells and beneficial for treating or prohibiting graft versus host disease and graft rejection. 5. Cellular Therapy: Therapy with immune competent cells against the virus (EBV) may be incorporated and the efficacy of the modality usually emerges from the graft versus leukaemia response of patients subjected to a bone marrow transplantation [4,6]. Lymphoid proliferations (PTLDs) emerging from a solid organ transplant may not benefit from the therapy. 6. Monoclonal Antibodies: Employment of anti B cell monoclonal antibody is a contemporary and efficacious methodology. Thus, anti CD 21, anti CD 24 and anti CD 19 monoclonal antibodies may prove to be advantageous in more than half the cases (61%) [19,20]. Rituximab has commercially displaced the monoclonal antibodies as rituximab is an anti CD20 monoclonal antibody molecule. Indolent and aggressive non-hodgkin’s lymphoma may benefit from the marker. CHOP regimen may incorporate rituximab for treating large cell lymphomas. The antibody may be used as a solitary instrument or concomitantly with chemotherapy for treating the numerous CD20+ haematological neoplasm (de novo chronic lymphatic leukaemia). Rituximab may be applicable in various nonmalignant and autoimmune disorders such as Rheumatoid arthritis, Sjogren’s syndrome, Systemic Lupus Erythromatosus, Myasthenia Gravis, Autoimmune Haemolytic anaemia and Idiopathic Thrombocytopenic Purpura . Rituximab along with chemotherapy are advantageous in patients that do not respond to immune suppression reduction. They enhance the patient survival and alleviate the symptoms of the disorder (PTLDs). Rituximab with CHOP may be sufficient, even for monomorphic PTLDs. Primary cerebral lymphoma emerging from a solid organ transplant may benefit from intrathecal rituximab [15,21]. Apart from rituximab, donor lymphocytes and virus specific (CTLs) may configure in the therapeutic protocols of post-transplant lympho-proliferative disease . A post transplant lympho-proliferative disease concomitant to an Epstein Barr virus related malignancy as a complication following an allogeneic stem cell transplant or a solid organ transplant may be elucidated . The immune suppressed individuals or transplant recipients may depict a decline or absence of function of Epstein Barr virus specific cytotoxic T lymphocytes (CTLs). The deficiency may augment the possibility of induction of PTLDs. Subsequent to probable failure of primary therapeutic approaches, an efficacious methodology of managing the emergent neoplasm may be the employment of Epstein Barr virus specific CTLs recovered from the bone marrow of a haplo-identical donor or a third-party donor . 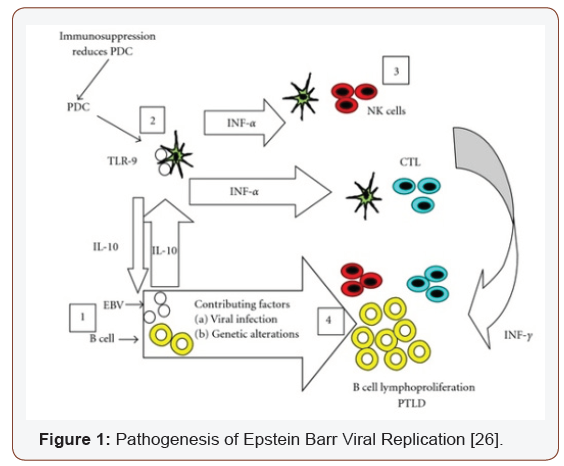 The technique of rapid isolation of Epstein Barr virus specific T lymphocytes may be adopted. 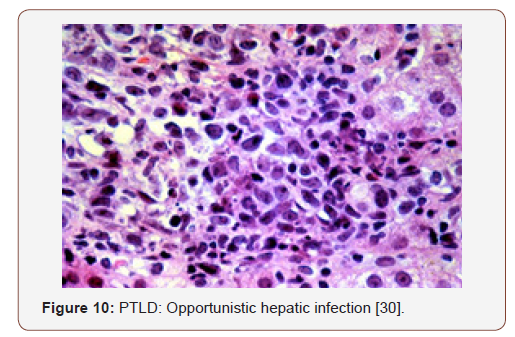 Multitudinous associated lesions of PTLDs with appropriate haplo-identical marrow (parents/sibling) may procure promising outcomes, particularly in individuals with life threatening Epstein Barr virus associated malignancies . Geis WP, Iwatsuki S, Molnar Z, Giacchino JL, Kerman RH, et al. (1978) Pseudo-lymphoma in renal allograft recipients. Arch Surg Apr 113(4): 461-6. Penn I, Hammond W, Brettschneider L, Starzl TE (1969) Malignant lymphomas in transplantation patients. Transplant Proc 1(1): 106-112. Paul S Martin (2015) Post transplant Lympho-proliferative Disorder. power point presentation. Cristian Sanchez La Rosa (2017) Post-transplant Lympho-proliferative disorder. Oncopaedia CEMIC, Buenos Aires Argentina, p1-29. Bishnoi R, Bajwa R, Franke AJ, Skelton WP, Wang Y, et al. (2017) Post transplant lympho-proliferative disorders: Single institutional experience of 141 patients. Exp Hematol Oncol 6(1): 26. Melissa Laub (2017) The ABC of Post-transplant lympho-proliferative disorders: A review of post- transplant lympho-proliferative disorders. Mayo clinic June power point presentation. Epstein MA, Achong BG, Barr YM (1964) Virus particles in cultured lymphoblasts from Burkitt’s lymphoma. Lancet 1(7335): 702-703. Henle W, Diehl V, Kohn G, Zur Hausen H, Henle G (1967) Herpes type virus and chromosome marker in normal leucocytes after growth with irradiated Burkitt cells. Science 157(3792): 1064-1065. Wang D, Liebowitz D, Kieff E (1985) An EBV membrane protein expressed in immortalized lymphocytes transforms established rodent cells. Cell 43(3): 831-840. Schubert S, Abdul-Khaliq H, Lehmkuhl HB, Yegitbasi M, Reinke P, et al. (2009) Diagnosis and treatment of post–transplantation lymphoproliferative disorder in paediatric heart transplant patients. Paediatr Transplant 13(1): 54-62. Swerdlow SH, Campo E, Pileri SA, Harris NL, Stein H, et at. (2016) The 2016 revision of world health organization classification of lymphoid neoplasm. Blood 127(20): 2375-2390. Jaffe ES, Harris NL, Stein H, Vardiman JW (2001) Pathology and Genetics of tumours of Haematopoietic and Lymphoid tissues. Lyon IARC press 3: 1-351. Koch DG, Christiansen L, Lazarchick J, Stuart R, Willner IR, et al. (2007) Post transplantation lympho-proliferative disorder- the great mimic in liver transplantation appraisal of the clinico- pathologic spectrum and the role of EBV virus. Liver transpl 13(6): 904-912. JJ Lee, MS Lam, A Rosenberg (2007) Role of chemotherapy and rituximab for treatment of posttransplant lymphoproliferative disorder in solid organ transplantation. Ann Pharmacother 41: 1648-1659. Swinnen LJ, LeBlanc M, Grogan TM, Gordon LI, Stiff PJ, et al. (2008) Prospective study of sequential reduction in immunosuppression, interferon alpha-2B and chemotherapy for post transplantation lymphoproliferative disorder. Transplantation: 86(2): 215-222. 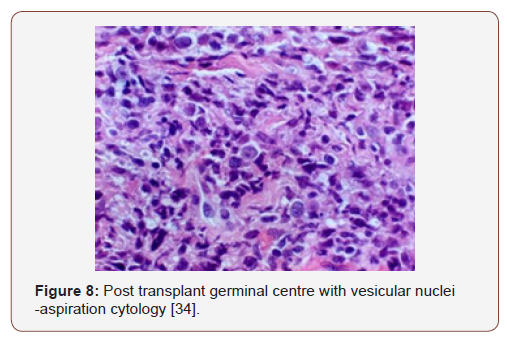 Penn I (1998) De novo malignancies in paediatric organ transplant recipients. Pediatr Transplant 2(1): 56-63. Cohen JI, Bollard CM, Khanna R, Pittaluga S (2008) Current understanding of the role of EBV virus in lymphoma genesis and therapeutic approaches to EBV associated lymphomas. Leuk Lymphoma 49(1): 27-34. Dharnidharka VR, Martz KL, Stablein DM, Benfield MR (2011) Improved survival with recent post transplant lympho-proliferative disorders (PTLD) in children with kidney transplants. Am J Transplant 11(4): 751- 758. Troy D Schultz (2017) Post transplant lymphoid disorders and management of residual mass chemotherapy: case report. Int J Surg Case Rep 38: 115-118. Hussein K, Tiede C, Maecker Kolhoff B, Kreipe H (2013) Post transplant lympho-proliferative disorder in paediatric patients. Pathobiology 80(6): 289-296. Reuben J Arasaratnam, Alejandro Restrepo (2017) Post transplant lympho-proliferative disorder presenting as an extra-cranial mass. Case Rep Transplant Article id: 6401086. Evens AM, David KA, Helenowski I, Nelson B, Kaufman D et al. (2010) Multicenter analysis of 80 solid organ transplantation recipients with post-transplantation lympho proliferative disease- outcomes and prognostic factors in the modern era. J Clin Oncol 28(6): 1038-1046. Heslop HE, Slobod KS, Pule MA, Hale GA, Rousseau A et al. (2010) Long term outcome of Epstein Barr virus specific T cell infusions to prevent or treat EBV related lympho-proliferative disease in transplant recipients. Blood 115(5): 925-935. Uhlin M, Wikell H, Sundin M, Blennow O, Maeurer M et al. (2014) Risk factor for Epstein Barr virus related post transplant lympho-proliferative disorder after allogeneic hematopoietic stem cell transplantation. Heamatologica 99(2): 346-352. Uhlin M, Okas M, Gertow J, Uzunel M, Brismar TB, et al. (2010) A novel haplo-identical adoptive CTL therapy as treatment for EBV associated lymphoma after stem cell transplantation. Cancer Immunology and immunother 59(3): 473-477. Image 2 Courtesy: Site 811699. 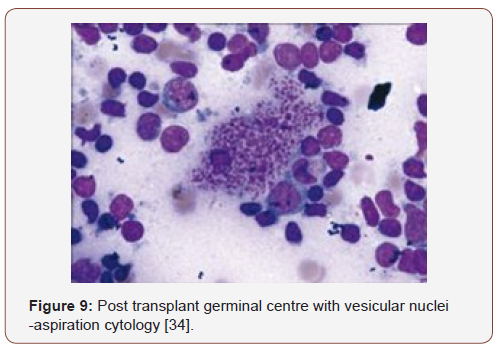 Image 3 Courtesy: Atlas of genetics and cytogenetics in oncology and haematology. Image 5 & 10 Courtesy: upmc.com. Image 7 Courtesy: Libre Path. Image 8 Courtesy: eMedicine Medscape. Image 11 courtesy: Page press.com.